Solar panels are known for their durability, often lasting more than twenty years. However, as they’re outside and open to the elements, they can gather dust, debris, and bird droppings over time. Enough accumulated dirt can potentially block sunlight and reduce your array’s efficiency. Though panels generally require only minimal maintenance, cleaning your panels every few years—or more frequently if you live in an area with a lot of pollution or dirt—can help extend their lifespan, increase system effectiveness, and ensure maximum power production. While you can clean your array yourself, you may not want to risk walking around your roof or accidentally voiding the warranty as you try to clean the array. In that case, you can rely on solar maintenance pros to clean your panels safely and thoroughly. 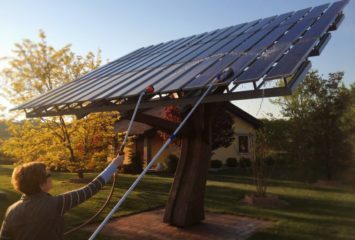 There’s no universal timeframe for cleaning solar panels—some climates and geographic locations require more frequent cleaning than others. However, if it’s been a few years since you installed your solar panels, or if you’ve recently experienced strong winds or a dust storm, it may be time to hire a commercial cleaning company. Here are a few steps to help you find the right company and service for you. 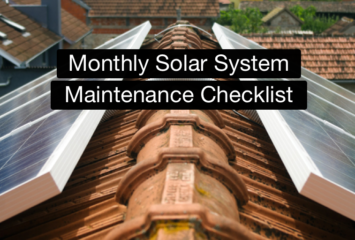 Contact your solar panel manufacturer or review your manual. Your panels may require particular materials for cleaning, or your system may need to be shut off before cleaning. The company from which you purchased your panels should be able to offer tips and advice. 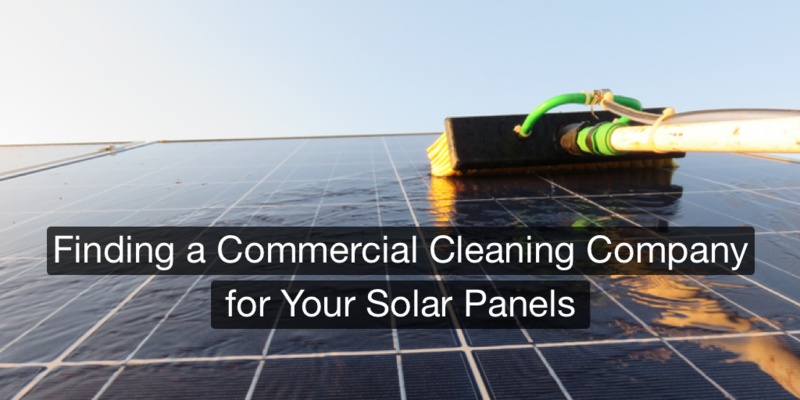 Research local businesses that offer commercial cleaning services for solar panels. Use review sites such as Yelp, Thumbtack, and Angie’s List to find recommendations and ratings from other customers. Check the Better Business Bureau (BBB) rating for any company you consider. A company’s website may provide its BBB rating, or you can search for the company on the BBB website. Compare a few different companies to see how their services differ. While you might expect all cleaning services to be more or less the same, they’re actually not. Cleaning companies differ in how they clean panels, what cleaning solutions they use, and whether they provide any other services like general maintenance checks. Request a consultation or custom quote, and have a representative from the company look at your panels in person first so that they can give you an accurate price based on the size of your system and its location. Most reliable businesses offer a complimentary consultation. Consider asking a company for referrals so you can chat with past customers about their experiences. Alternatively, you can message a Yelp reviewer to ask for more details on the services they received from the company. There are countless solar cleaning companies throughout the United States. If you need help kick-starting your search, here are a few to consider. What Sets It Apart: Solar Maid has one of the largest service areas we’ve seen. Most solar cleaning companies are local businesses that serve limited areas, but Solar Maid offers cleaning services in multiple states. Solar Maid offers several solar operations and maintenance services beyond cleaning, including snow removal, snow guard installation, and more. What Sets It Apart: HelioPower has in-depth solar knowledge and provides comprehensive maintenance services. Ideally, it’s best to find a cleaning service that includes a general maintenance check and inspection. HelioPower ticks all those boxes. Before an in-depth cleaning, the pros perform a visual inspection, and the company tackles all electrical components as well. Based in California, HelioPower services residences and companies throughout the state. What Sets It Apart: Blue Oak Energy works primarily with commercial and large-scale solar installations. If you have a large-scale solar install, you want it cared for by experts. Blue Oak Energy not only provides comprehensive maintenance services, but it also designs and builds solar panel systems. Along with cleaning panels, the company offers preventative and corrective maintenance, system management, system testing, and more to ensure your system is working as efficiently as possible. What Sets It Apart: Heliotex automates panel maintenance and cleaning. What if a machine could automatically clean your panels for you? It’s possible with Heliotex, which provides automatic solar panel cleaning systems. The system cleans your array on a regular basis based on your panels and environment. Heliotex installs the cleaning system for you, along with security fasteners and anti-theft devices. A solar panel system is a significant investment. While you won’t need to dedicate too much time, money, and energy into maintaining your system, don’t neglect it. Giving your panels some TLC in the form of a good scrub down can help your system last longer, look nicer, and generate more energy so you can save money on your power bill and reduce your carbon footprint. Check out a few of these companies or search on review sites to find a local provider. And if you know of a fellow solar owner, share this piece to help guide them on their solar cleaning-service search. *Note: SolarPowerAuthority does not guarantee services offered by any of the above companies. We recommend that you follow the tips above to find the right company for your specific solar setup. Glad you are publishing this blog post. I am actually a pretty long time reader but haven’t put down comments here before.